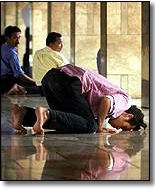 How Can the Muslim Discipline One's Self? 1- Worshipping Allah, keeping in contact with Him and submitting to Him. That is done by paying attention to doing obligatory acts of worship well, and cleansing your heart of any attachment to anything other than Allah. 2- Reading Qur’aan a great deal, pondering its meanings and seeking to understand it. 3- Reading useful religious books that describe the ways of treating and cleansing the heart, such as Mukhtasar Manhaaj al-Qaasideen, Tahdheeb Madaarij al-Saalikeen and so on; reading the biographies of the salaf and learning about their attitude and behaviour, such as Sifat al-Safwah by Ibn al-Jawzi and Ayna nahnu min Akhlaaq al-Salaf by Baha’ al-Deen ‘Aqeel and Naasir al-Jaleel. 4- Attending educational programs such as classes and lectures. 6- Not indulging too much in permissible things and not paying too much attention to them. 7- Keeping company with righteous people and looking for righteous companions, who can help you to do good. Those who live alone will miss out on a lot of the characteristics of a good brother such as preferring others to oneself and being patient. 8- Trying to act on what you learn and put it into practice. 9- Checking closely on yourself. 10- Having confidence in yourself – whilst relying on Allah – because the one who has no confidence cannot act. 11-Despising yourself for not doing enough for the sake of Allah. This does not contradict the things mentioned above. Man has to strive hard whilst still thinking that his efforts are not enough. 12-Practising withdrawal or isolation as prescribed in sharee’ah..You should not mix with people all the time, rather you must have some time which you spend alone, in worship as prescribed in Islam. We ask Allah to help us and you to discipline ourselves and submit to that which Allah loves and is pleased with.